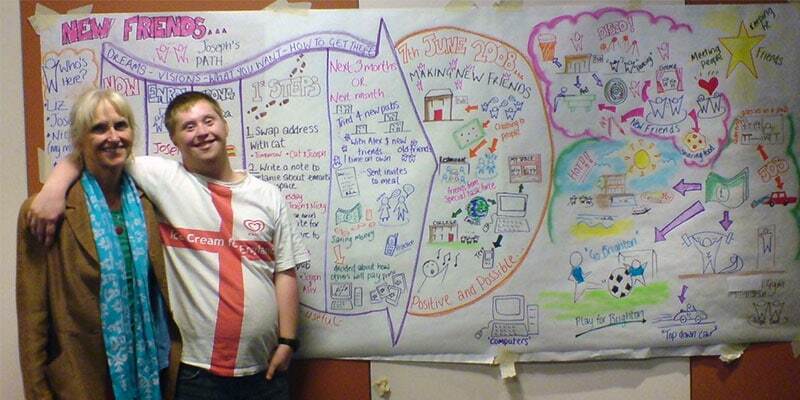 Person centred planning is a way of expressing a set of inclusive values through a unique range of tools and techniques. The most commonly used person centred tools – MAPS and PATH – create a hands-on demonstration of these values in action. All person centred planning tools and processes are driven by a commitment to achieve inclusive outcomes for the person whose plan it is, and the young people involved are always present throughout their planning session. The focus of all person centred approaches is the whole person irrespective of the label they carry. Two people, a process facilitator and a graphic facilitator, typically facilitate plans. The role of the support service staff in this work is as a facilitator not as an expert participant, problem solver, assessor or provider of consultation. MAPS and PATH are especially effective tools in planning transitions and annual review processes for young people with additional support needs and for through-care planning for young people who are looked after or accommodated. Over time person centred working will reveal areas of unmet need in current provision and thereby inform the ongoing strategic planning within any particular region. MAPS and PATH live demonstrations of both tools in action followed by real time coaching of facilitation skills. We would stress that this is an introductory day and that participants will be expected to make plans for their own follow up and further practice of the tools covered in the course of the day.